The Colorado State Rams football program, established in 1893, represents Colorado State University and is a member of the National Collegiate Athletic Association (NCAA) Division I Football Bowl Subdivision and Mountain West Conference (MW). Rams football teams have had relative success over the years, including winning or sharing the Mountain West title in 1999, 2000 and 2002. Home games have been played at Sonny Lubick Field at Hughes Stadium, located four miles west of the school's campus in the foothills of the Rocky Mountains, since 1968. The current 2016 season is the Rams' last at Hughes Stadium. The university is building a new on-campus venue tentatively known as Colorado State Stadium, and plans to complete it in time for the start of the 2017 season. The Rams have long-standing rivalries with Colorado, Wyoming, and Air Force. Colorado State football dates back to 1893, when it was known as Colorado Agricultural University. Its first football coach was W. J. Forbes, who led the team in 1899 to a 1-2-1 record. He was succeeded by George Toomey in 1900, who led the Rams to a record of 1-3. Harry W. Hughes accepted the position of athletic director and head football coach at Colorado Agricultural University in 1911 and turned a winless team in 1911 into conference champions and an undefeated record in 1915. Hughes also helped build Colorado Field, the first sodded football field in Colorado history, replacing Durkee Field (1899–1911). Colorado Field was the home of the Colorado Aggies and Colorado State Rams from 1912 to 1967. Harry Hughes won eight conference championships in the Rocky Mountain Athletic Conference in 1915, 1916, 1919, 1920, 1925, 1927, 1933, and 1934. He was a member of the NCAA National Rules Committee beginning in 1926 until his retirement. Hughes coached the Aggies from 1911 to 1941 in football and remained as the Athletic Director until his retirement in 1953. In the early 1930s Hughes was given the nickname "Dean of American Football Coaches" by sportswriters and fellow coaches for his many seasons at one school. He was famously known as one of the most fair and sportsmanlike football coaches in America. He coached football from 1911 to 1941 and after resigning as football coach in 1946, he remained as the school's Athletic Director until 1953. Upon his retirement he was inducted into the Helms Football Hall of Fame on Harry Hughes Day, November 8, 1952. Known as a tough but fair coach, Hughes was a strict disciplinarian who developed a play in 1914 known as the Million Dollar Play. This triple pass was an end around play based on the single wing formation and helped Hughes lead his teams to national fame. Some of Hughes' greatest players were Ralph "Sag" Robinson (All-American Honorable Mention 1916), Kenneth Hyde (1925 All-American 3rd team) and Glenn Morris (1936 US Olympic Decathlon Gold Medal winner). Hughes broke the color barrier in modern Colorado football in 1939 when he played John Mosley between 1939 and 1942. When Colorado State University built their new football stadium in 1968, it was named Hughes Stadium in his honor. Hughes' final record at CSU was 126-92-18. Bob Davis was named as the head coach of football, replacing the legendary Hughes, on January 6, 1947. Bob Davis utilized the "T" formation and veterans returning from World War II to turn around a 2-7 Aggies team in 1946 to an 8-2 team in 1948; placing second in the Skyline Conference. Colorado A & M (as the school was then called) was invited to and played in the January 1, 1949 Raisin Bowl in Fresno, California against Occidental College. Only losing 21-20 in the last minutes of the game, Davis' 1949 team went on to a 9-1 record and placed second again. Bob Davis was a revolutionary coach utilizing classroom football along with practice and game films to help his players excel. Davis also played black athletes in a predominantly white school such as Eddie Hanna, George Jones and Alex Burl. Several of Bob Davis' players went on to the National Football League including Dale Dodrill, Thurman "Fum" McGraw, Jim David, Don Burroughs, Jack Christiansen, Alex Burl and Gary Glick. Three of his players were All-Americans; Thurman "Fum" Mcgraw (first team 1948, 1949), Harvey Achziger (first team 1952) and Gary Glick (second team 1955). Davis' 1955 team won the Skyline Conference Championship but following the season he resigned from coaching football to concentrate on his duties as Athletic Director. Davis' record with the Rams when he left was 54-33-2. A player for Colorado A & M under Harry Hughes, Don Mullison was promoted from line coach to head coach when Bob Davis retired. However, the Rams freefell to a record of 19-40-1 in Mullison's six seasons, which included a winless 0-10 campaign in 1961. Mullison was not retained as head coach past the 1961 season. Delaware line coach Mike Lude was selected as Mullison's replacement, and under his tutelage, Colorado State, as they had switched from Colorado A & M, compiled a record of 29-51-1. In 1962, the Rams duplicated the previous year's mark of 0-10, and in 1964, the Rams posted their best record under Lude, a 5-6 mark. The inability for Lude to turn around the Rams led to his firing in 1969 after eight seasons. The Rams continued to struggle under Lude's successor, Jerry Wampfler, who had arrived in Fort Collins as a prized line coach at Notre Dame under legendary head coach Ara Parseghian. The Rams continued in their misery, compiling a record of 8-25 before Wampfler resigned following the 1972 campaign. Colorado State improved its performance under head coach Sark Arslanian, who came to Fort Collins from his post as head coach at Weber State. Despite a few down years, Arslanian's record at CSU was 45-47-4. The highlight of the Arslanian era came in 1977, when the Rams beat all odds and cmoplied a 9-2-1 record, their first such season in years. Despite the success, the Rams didn't get a bowl invite that season. A poor start to the 1981 season cost Arslanian his job. He was fired after the Rams fell to 0-6 to start the season. Texas defensive coordinator Leon Fuller, a Bear Bryant disciple, took over the Rams football program in 1982. However, Fuller also struggled to find success. He went 25–55 through seven seasons and resigned under pressure after the Rams finished the 1988 season at 1–10. CSU next turned to a veteran head coach, turning to former Iowa State and Ohio State head coach Earle Bruce. In his second season, Bruce led the Rams to a 9-4 record and a victory over Oregon in the Freedom Bowl, their first bowl appearance since 1948 and their first bowl victory ever. In his final season at Fort Collins, he coached the Rams to a 17-14 victory over LSU in Baton Rouge. Bruce was fired in 1992 for, among other things, verbally and physically abusing his players and discouraging players from taking classes that conflicted with football practice. 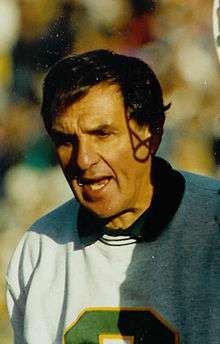 Sonny Lubick, who had previously served as defensive coordinator at Miami under head coach Dennis Erickson, took over the Rams as head coach in 1993, and, under his tutelage, the Rams made nine bowl appearances. CSU had only two previous bowl appearances. Faced with a culture of losing, Lubick assembled a staff of assistants that included eventual Ohio State head coach Urban Meyer, and began aggressively recruiting and attempting to change CSU's image. Considering the dreadful state of the program he'd inherited, Lubick made the Rams respectable fairly quickly. After starting 1–4 in his first season, the Rams won three consecutive games to finish the season 5–6, providing hope that the program was headed in the right direction. The "right direction" would take Colorado State to heights they had never seen before in 1994. Led by a defense that featured future NFL players Sean Moran and Brady Smith, Colorado State flew out of the gate 6–0 heading into a key game on October 8 against the #4 Arizona Wildcats in Tucson, Arizona. Known for their vaunted "Desert Swarm" defense, Arizona had been picked by several publications, including Sports Illustrated, to win the national championship, but it was CSU that took a stunning 14–6 lead. With Arizona driving to the CSU 21 in the second half, Garrett Sand forced a fumble that Moran recovered and ran back 79 yards for a touchdown. Regarded simply as "The Play" in CSU football history, the return ended up being the game-winning score, as Lubick and the Rams engineered the greatest upset in the program's history 21–16. Near-rioting broke out in Fort Collins as a result of celebrations from students and fans. A victory the following week over UTEP set up a nationally televised showdown with Utah, also undefeated, at Hughes Stadium. With extra bleachers brought into the 30,000 seat facility, a crowd of 39,107, the largest in Hughes Stadium history, witnessed a heartbreaking 45–31 shootout loss. Despite the setback, the Rams recovered to win their final three games, including a dramatic 44–42 comeback win at Fresno State that sealed CSU's first ever outright WAC championship (Utah lost twice more during the regular season following their win at CSU). The victory earned Colorado State their first-ever trip to the Holiday Bowl in San Diego, where the Rams lost a hard fought 24–14 affair to Michigan. Though the season ended on a down note, the Rams' 10 wins were a program record for victories in a single season. The 10–2 campaign was the start of 10 straight winning seasons under Lubick, and also earned him National Coach of the Year honors from Sports Illustrated. Lubick's Rams followed up their breakout campaign in 1994 with a strong 1995 season. With Smith earning WAC defensive player of the year honors, and safety Greg Myers earning All American honors for a second straight year, CSU finished the 1995 season with an 8–4 mark and a share of the WAC title. The Rams were once again invited to the Holiday Bowl, but this time they were downed by the Kansas State Wildcats by a score of 51–24. In 1996, the Rams posted another winning season, finishing 7–5 and tied for second place in the WAC. However, a lack of quality wins, and losses to Colorado, Oregon, Nebraska, and Wyoming kept the Rams out of a bowl game. The 1997 season also got off to a difficult start. Colorado State blew a halftime lead against arch-rival Colorado in their second game to lose 31–21. Two weeks later, the Rams suffered a 24–0 shutout loss at home against Air Force to fall to 2–2. It would be the last game Lubick's Rams lost for the rest of the season. Led by quarterback Moses Moreno, the WAC Offensive Player of the Year, running back Kevin McDougal, and future Pittsburgh Steelers linebackers Joey Porter and Clark Haggans, Colorado State stormed through the rest of league play, with a 14–7 victory at Wyoming October 18 the closest they came to defeat. Winning their second outright WAC title, the Rams once again went to the Holiday Bowl, this time facing the Missouri Tigers. Down three at halftime, CSU scored 21 second half points to defeat the Tigers 35–24, netting Lubick his first ever bowl victory, extending a school record nine-game winning streak (the streak would be end at ten in 1998), and finishing what is still the greatest season in school history at 11–2. During this period of success, Lubick reportedly received interest and coaching offers from several other high-profile programs, including Miami and USC. But commitment to his program, and intense efforts from fans to keep the lovable coach in Fort Collins, lead to Lubick staying at CSU each time. In 1998, Lubick's Rams finished 8–4 and third in the WAC, but were not invited to a postseason bowl. Prior to the 1999 season, eight member schools of the WAC (Air Force, Colorado State, BYU, Utah, San Diego State, Wyoming, New Mexico, UNLV), upset over conference expansion that threatened to balloon travel costs and break up longstanding regional rivalries, broke away from the conference and formed a new league, the Mountain West Conference. But 1999 would be memorable for Ram fans for another reason. Since the day they began playing football, CSU had more often than not failed to beat their in-state rivals, the Colorado Buffaloes. With superior resources and (since moving to the Big Eight in 1947) playing in a superior league, Colorado often overshadowed Colorado State. Lubick had gone 0–3 in his first three games against Colorado. On September 4 the game, dubbed the Rocky Mountain Showdown, was played at a neutral site, Mile High Stadium in Denver for the second straight year, and the Rams were once again considered underdogs against the ranked Buffaloes. However, behind 189 rushing yards and two touchdowns from McDougal, the Rams blew out the Buffaloes 41–14, marking the first time in 13 years that CSU had beaten their in-state rivals. The victory was seen by many as the final step in CSU's ascension to legitimacy. Victories over Wyoming and Air Force also completed the "Front Range" sweep, and the Rams finished 8–4 again, this time tying for the Mountain West title. CSU was invited to the Liberty Bowl, but lost to Southern Miss 23–17. In 2000 Lubick's Rams, led primarily by Mountain West Conference Offensive Player of the Year Matt Newton, defeated Colorado for the second straight season 28–24. The victory was the catalyst for a 10–2 season that included an outright Mountain West title and a 22–17 Liberty Bowl victory over Louisville. With the graduation of several key seniors, and the preseason loss of starting running back Cecil Sapp to injury, Lubick faced a rebuilding year in 2001. The Rams still managed a 7–5 finish and a 45–20 New Orleans Bowl victory over North Texas. 2001 was also notable for the emergence of quarterback Bradlee Van Pelt. A transfer from Michigan State, Van Pelt's dual threat capability as a running and passing quarterback would make him a two-time conference player of the year. But it was his game in 2002 against Colorado that made Van Pelt a cult hero in Fort Collins. After losing to CU in 2001, Van Pelt and the Rams, bolstered by the return of Sapp, went into their Rocky Mountain Showdown heavy underdogs against a Buffaloes team ranked sixth in the nation. Trailing 14–13 late in the fourth quarter, Van Pelt broke loose on a 26-yard touchdown run. As he neared the goal line, Van Pelt turned and spiked the football off of CU cornerback Roderick Sneed's helmet as he scored what would be the game-winning touchdown. Following the game, Van Pelt called CU "the sorriest sixth-ranked team in the nation he had ever faced". It was the second biggest upset in school history, and further added to Van Pelt's following in Fort Collins. Though the outspoken quarterback occasionally gave Lubick problems, the 2002 season would be another banner season. With Sapp setting the school single season rushing record, the Rams finished 2002 with a 10–4 record and another Mountain West Conference title. The 2003 Ram football team was considered by many to be the best team in Lubick's tenure, if not all of CSU history, prior to the season. Though Sapp was gone, Van Pelt and many other seniors returned, and high-profile Colorado-transfer Marcus Houston was added to the mix. The Rams entered the season ranked 24th in the nation and with hopes of cracking the Bowl Championship Series. Those hopes were quickly dashed when the Rams were upset in their opener by CU 42–35. Though CSU did make a bowl game for the fifth straight season, the Rams' 7–6 finish was the start of a down period for Lubick and his program. With Van Pelt gone, CSU faced another rebuilding year in 2004. A particularly devastating loss at Folsom Field against Colorado on September 4, in which Lubick later admitted to mismanaging CSU's final series that ended in the Rams failing in three plays from CU's one yardline to score what would have been a game-winning touchdown in a 27–24 loss, led to a 4–7 finish, the worst year in Lubick's tenure. The 2005 season started once again with another devastating loss at Colorado on September 3. Leading 21–10 after three quarters, three interceptions allowed CU to tie the game, and Mason Crosby kicked a game-winning 47-yard field goal with five seconds left to give the Buffs a 31–28 win. This time the Rams regrouped. Behind school record setting wide receiver David Anderson, and buoyed by the surprising emergence of thousand yard sophomore running back Kyle Bell, CSU finished the regular season 6–5 and tied for second place in the Mountain West. However, a blowout 56–32 loss to Navy in the Poinsettia Bowl seemed to be another setback. Following the 2005 season, Lubick signed a three-year contract extension that would have made him CSU's coach through the 2009 season. Unfortunately, the Lubick family was dealt a difficult blow in the offseason. In February, Lubick's youngest son, Marc, was diagnosed with Rhabdomyosarcoma cancer. The younger Lubick had just finished his first season as Colorado State's wide receivers coach, a position he took over after his brother Matt left the program in 2005 after spending the previous four seasons coaching that position under his father. Marc Lubick underwent chemotherapy and coached during the 2006 season. The Rams entered the 2006 season with high hopes, but on and off field problems quickly beset the program. Just three days prior to the season opening game against Weber State on September 2, preseason all-conference back Kyle Bell was lost for the season with a torn ACL during a practice. A sophomore in 2005, Bell had run for over 1,000 yards and figured to be the centerpiece in CSU's offense. 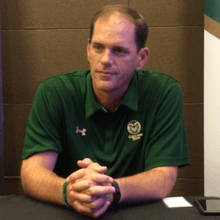 The Rams defeated Weber State 30–6, but lost another starter prior to their game against archrival Colorado on September 9, this time due to scandal. Several players, including preseason All-MWC cornerback Robert Herbert, were suspended indefinitely from the program after being charged with fraud in a campus check-cashing scandal. Herbert had arguably been the team's best defender in 2005. Despite these losses, however, the Rams started the 2006 season strong. On September 9, after three years of frustratingly close losses, the Rams defeated their in-state rival CU 14–10 at Invesco Field at Mile High Stadium. After dropping a 28–10 decision at Nevada the following week, CSU rebounded with a road win at Fresno State and homecoming win against UNLV to go to 4–1. Playing at in-state rival Air Force on October 12, the Rams opened up a 21–3 halftime lead and appeared to be well on their way to a fifth victory. However, the Falcons rallied for 21 unanswered points and came back to defeat CSU 24–21. The loss was the beginning of one of the worst slides in Lubick's tenure. The following week Colorado State was shut out 24–0 at Wyoming in the annual Border War series. Home losses to New Mexico and BYU followed, and the Rams ultimately never recovered. Losses to Utah, TCU, and San Diego State concluded a season-ending, seven-game losing streak, leaving CSU 4–8 and tied for last place in the Mountain West, by far the worst year in Lubick's tenure and leading some fans and followers to question whether Lubick should be retained or released. Lubick's 14th season got an immediate boost with the return of Bell. With their all-conference halfback in the fold, as well as the most seniors returning in Lubick's tenure, the Rams had a team that figured to rebound from the dismal 2006 season. But a difficult early schedule challenged CSU. Opening against Colorado at Invesco Field at Mile High, the Rams had a familiar finish against their in-state rival. Despite big games from Bell and Kory Sperry, CSU squandered an 11-point 3rd quarter lead and went into overtime. On their possession, Caleb Hanie threw an interception in the endzone. CU would win in overtime, 31–28. Following the CU loss, Colorado State faced one of its most daunting home games ever against then-10th ranked California. The Bears were heavily favored but Colorado State, playing in its home opener, was game. CSU lost a thriller 34–28, their 9th straight loss dating back to 2006. Even worse, the bizarre chain of season-ending ACL injuries to key players continued when Sperry was lost with a torn ACL during the game. It was the 3rd straight season a key player for the Rams had been lost to the injury. Losses continued to mount. Dating back to 2006, CSU lost 11 straight games before defeating UNLV at mid season. Colorado State finished the season 3–9, a new low in the Lubick tenure. The lone bright spot of the year came at the end of the season when the Rams regained the Bronze Boot with a 36–28 win over Wyoming at Hughes Stadium. It would end up being the final game in Lubick's tenure at CSU. On February 2, 2008, the Rocky Mountain News reported that Lubick had declined the university's offer to remain in a fundraising role. The paper quoted a source as saying Lubick, 70, had talked with Florida coach Urban Meyer about joining the Gators' staff. Meyer was an assistant under Lubick in the early 1990s. The job was reported to involve breaking down film and helping with recruiting. However, Lubick did not take that job. Lubick won nearly 75% of home games in the stadium that would later bear his name, leading the team to six conference titles and a 108–74 record. CSU was consistently a top 25 contender from 1994–2002, with a 79–32 record during that period and 3 top 25 finishes. Lubick, conference coach of the year four times, coached former Denver Broncos Cecil Sapp and current Buffalo Bills offensive tackle Erik Pears, and All-Pro NFL linebacker Joey Porter. In December 2007, Colorado State University announced that Buffalo Bills offensive coordinator Steve Fairchild would be returning to his alma mater to serve as head coach. CSU surprised in its first year under Fairchild. After a 38–17 loss to Colorado in his debut, Fairchild won his first game with CSU, a home victory over Sacramento State 23–20 thanks to a Ben DeLine field goal. The Rams followed that up with a 28–25 win over Houston one week later. However, CSU would lose 5 of their next 7 games, including tight home losses to conference powers TCU (13–7) and BYU (45–42). CSU rallied to win their final two games, with their 31–20 victory at Wyoming, securing their sixth win and a berth in the New Mexico Bowl. Underdogs to Fresno State, CSU won a 40–35 thriller for their first bowl victory since the 2001 New Orleans Bowl. The star of the game (and most of the season) was senior RB Gartrell Johnson, who ran for a career high 285 yards and added 90 receiving yards. His 375 total yards were the most for one player in bowl history. He ran for two touchdowns, the final being a game winning 77-yard touchdown run in the fourth quarter. Johnson would be named first team all-MWC following the season. Fairchild became the first coach in CSU history to post a winning season in his first year with the program. Despite graduating Johnson and several other seniors, 2009 started much the way 2008 ended. The Rams opened the season September 6 at arch-rival Colorado. With a bevy of returning starters, and the game being played in Boulder for the final time (both schools had agreed to play the next decade's worth of games at Invesco Field at Mile High Stadium), the Buffs were heavy favorites. However, CSU led from start to finish, beating Colorado 23–17, marking their first victory at Folsom Field since 1986. Following home victories over Weber State and Nevada, the 3–0 Rams appeared headed to postseason yet again. However, the season would derail quickly. Following a 42–23 loss at ranked-BYU, the Rams dropped a 31–29 decision at Idaho followed by 24–17 home defeat to Utah. They were the first of four losses that would come by seven points or less. The Rams would not win another game for the rest of the season. A loss to previously winless New Mexico (29–27) assured CSU of a last place finish, and a 17–16 home defeat to Wyoming the day after thanksgiving not only cost the Rams the Bronze Boot (and their first home loss to Wyoming in 12 years), but made CSU just the 3rd team in Mountain West Conference history to go winless in conference play (Wyoming having done so in 2000 and 2001). 2010 was just as miserable. The Rams finished with an identical 3-9 record with their lone wins home victories over lowly Idaho, New Mexico and UNLV. Blowouts were frequent and the most embarrassing came in the season's final two games. On senior day the Rams were shelled by Brigham Young 49-10. The following week they concluded their season with a 44–0 drubbing by rival Wyoming in the Border War. Wyoming hadn't won a single conference game until that dominating win over Colorado State. It was hoped that Colorado State would begin to turn the corner in 2011, Fairchild's fourth year. Despite a 28-14 loss to rival Colorado, the Rams started 3-1 highlighted by a dramatic 35-34 comeback win in double overtime at Utah State on September 24. It would be CSU's final win. The following week CSU fell 38-31 to San Jose State on homecoming, the start of an 8-game losing streak. Fairchild was fired by new athletic director Jack Graham on December 4, 2011, one day after his Rams lost to the Wyoming Cowboys in the Border War. It was their third straight loss to Wyoming and the third straight time CSU finished their season 3–9. On December 12, 2011, Graham hired Alabama offensive coordinator Jim McElwain to replace Fairchild. 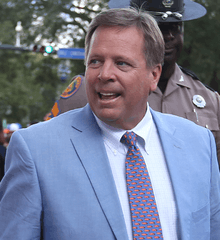 The move was well-received, as McElwain had won two national championships at Alabama as offensive coordinator under legendary head coach Nick Saban. McElwain's tenure, dubbed by the school's athletic department as "A Bold New Era", began on a high note. McElwain's Rams rallied from an 11-point deficit to defeat arch-rival Colorado 22–17 at Sports Authority Field in Denver on September 1. McElwain became the first CSU coach to win his debut since Jerry Wampfler in 1970 and the first to ever win his debut against CU. The momentum didn't last long, though, as CSU suffered a 22–9 setback in their home opener one week later to defending FCS National Champion North Dakota State, the start of a six-game losing skid. The program showed improvement towards the end of the season, winning three of their final five games to finish 4–8 in McElwain's first season. McElwain's second season with CSU was much more successful. CSU began the season losing their first two games, both of which they had led in the 4th quarter. However, CSU finished the season winning 8 of its next 12 games. McElwain finished his second season with a record of 8–6 after CSU's miraculous comeback win in the New Mexico Bowl. CSU's third season under McElwain led to even greater accomplishments. After a Week 2 loss at Boise State, the Rams reeled off 9 straight wins, climbing as high as #21 in the national rankings, and being in the conversation for a possible New Year's Day bowl bid. Those hopes were dashed, however, in their final regular season game at Air Force, when the Falcons hit a game-winning field goal as time expired, finishing CSU's regular season at 10–2. As a result of the successful transformation of the program, McElwain was named the Mountain West Conference's coach of the year on December 2, 2014. Before the final game of the 2014 season, McElwain accepted the position of head coach at Florida, becoming the first Rams football coach to leave the team for another. He did not coach the Rams through their final match, a loss. On December 23, 2014, Georgia offensive coordinator Mike Bobo took the head coaching job at CSU. His hiring marked the second straight SEC offensive coordinator to lead the Rams football program. In Bobo's first season, the Rams compiled a record of 7-5, which culminated in a loss in the Arizona Bowl. The CSU Rams' first bowl game was the California Raisin Bowl January 1, 1949 against Occidental College. The Rams lost 21–20 despite a tremendous performance from left half Eddie Hanna. Under Sonny Lubick, the Rams played in their two of their biggest bowl games to date. The first was the 1997 Holiday Bowl 35–24 victory over the Missouri Tigers while the second was the 2000 Liberty Bowl 22–17 victory over the Louisville Cardinals. During both of these winning seasons, the Rams were ranked in the top 25 football teams by both the coaches and AP polls. In the first season under new head coach Steve Fairchild, the CSU Rams were able to beat Fresno State 40–25 in the 2008 New Mexico Bowl. During this game, running back Gartrell Johnson rushed for 285 yards and received five passes for 90 yards for a total of 375 yards, setting an FBS record for most combined rushing and receiving yards in a bowl game. Under Jim McElwain's second year of coaching the Rams, CSU went to the New Mexico Bowl. On December 21, 2013, the CSU Rams faced the Washington State Cougars. In one of the most memorable comebacks of the decade, the Rams were able to score 18 points in the last 4 minutes of regulation game play to defeat the Cougars 48–45. The game between Colorado State and in-state rival Colorado, now dubbed the Rocky Mountain Showdown, began in 1893. The rivalry series was continued annually until 1958, then was resurrected in 1983. Since 1998, the game has been held mostly in Denver. Since moving to Sports Authority Field at Mile High, the teams have consistently played before the largest crowds in state history to witness a college sporting event. On August 31, 2009, Colorado State and Colorado signed a 10-year contract extension of the Rocky Mountain Showdown which brought the game back to Denver's Sports Authority Field at Mile High from 2010 to 2019. The 2020 game is scheduled to be played at Colorado State Stadium, the upcoming replacement for Hughes Stadium. Colorado leads the series 64–22–2. The rivalry between Colorado State and Wyoming, another member of the Mountain West Conference, is the longest rivalry in each school's history and also known as the "Border War" or "Battle for the Bronze Boot". The rivalry began in 1899. Since 1968, the schools have battled for possession of the Bronze Boot traveling trophy. The bronzed battle boot was worn in Vietnam by Colorado State alumnus Dan Romero. The boot is currently held by Colorado State after their victory over Wyoming in October 2013. Colorado State leads the series 57–44–5. The Ram–Falcon Trophy originated in 1980 to highlight the rivalry between Colorado State and the Falcons of the U.S. Air Force Academy, another Mountain West Conference member in Colorado that is in Colorado Springs. The wood-carved trophy was produced by local artist Bill Wrage. The Air Force ROTC detachment on the CSU campus initiated the creation of the trophy. Air Force leads the series 32–20–1. In July 2016 Under Armour designed new uniforms as part of its new five-year agreement to be CSU's exclusive provider of game-day uniforms, as well as footwear, apparel and training equipment for each of CSU's 16 varsity sports teams. The new deal took effect on July 1 and runs through 2020. In addition to the home and away jerseys, it will include five alternate gameday uniforms that Under Armour will supply for the Rams' football program, including the special "Orange Out" uniforms it has supplied for the annual Ag Day game. Future non-conference opponents announced by the CSU Rams athletic department. ↑ White, Rob (September 12, 2015). "CSU breaks ground on new football stadium". Coloradoan. Fort Collins, CO. Retrieved September 14, 2015. ↑ "SPORTS PEOPLE: COLLEGE FOOTBALL; Colorado State Lists Charges Against Bruce". The New York Times. November 26, 1992. Retrieved May 1, 2010. ↑ Frei, Terry (4 December 2014). "Jim McElwain leaves CSU, named Florida head football coach". Denver Post. Denver Post. Retrieved 12 December 2014. ↑ O'Keefe, Katie (2013-12-21). "CSU Football WagesComeback to Defeat Washington State in New Mexico Bowl". Collegian. Retrieved 2013-12-21. ↑ "Colorado versus Colorado State". sports-reference.com/cfb. Retrieved October 23, 2014. ↑ "Colorado State Rams Football Schedules and Future Schedules". fbschedules.com. Retrieved 2012-02-25. Wikimedia Commons has media related to Colorado State University.